Ideal for hunting and tactical use. This is by far one of the best value scopes on the market. The feature range nothing short of spectacular for a price of less than $130. The Leapers UTG SWAT 3X to 12X/44mm Compact Scope is an outstanding piece of equipment performing effortlessly alongside higher-end rifle scopes at a fraction of the cost. This range-estimating scope is perfectly suited for tactical applications ranging in caliber from .22 to .308, and is an excellent option for AR-15-type rifles. A 30mm, sealed and shockproof tube built on UTG's True Strength Platform, superior optics, easily lockable turrets with a reset-to-zero option, and EZ-TAP illuminated color reticle make this product an absolute pleasure to use in any environment and weather condition. While this may not be the right scope for long-distance shooting or big game hunting, the UTG 30mm scope is perfect for short-range hunting and tactical scenarios. 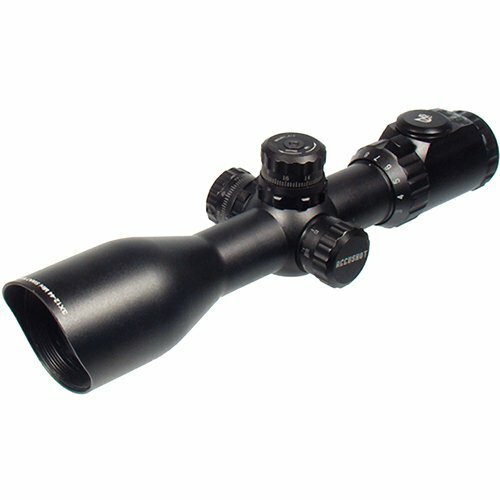 At this incredible price you simply will not find a more fully featured scope on the market. There are so many useful features on the Leapers UTG 30mm 3X to 12X/44mm rifle scope that the extremely low sticker price of around $100 is hard to believe. This is an extremely well-built scope made to withstand lots of abuse. A built-in sunshade and flip cover protect the objective lens from the elements and excess light. A specially designed circuit and battery housing allows for continual, uninterrupted reticle illumination even during the most violent of recoils. Optimized for tactical operations, this UTG scope offers solid turret adjustments with options to lock and return-to-zero. The optics are far superior to any other available in this price range. All-in-all, this is one of the best scopes one could purchase for under $200. The Leapers UTG 30mm Compact Scope offers an impressively wide field of view at both ends of its magnification range. The 3X magnification offers a full 34-foot view, while the 12X continues to measure a wide view at 8.4-feet. The improved visibility is advantageous for tactical situations where field of view is a potentially mission-critical feature. You would have to search far and wide to find a reticle option as versatile as the EZ-TAP 36-color, illuminated mil-dot reticle on this UTG scope. The adjustable color illumination makes the mil-dot reticle easily visible against any backdrop, and in any light condition. If you are out in the open on a sunny day, the reticle can be set to a darker shade in order to stand out against the brightness. If you are indoors, or in a densely wooded area, a bright orange or yellow reticle will contrast nicely. The options are endless, easily set with a low-profile control knob on the top of the scope, and have even been lauded as beneficial to color-blind shooters, who are able to set the reticle to a color easily recognizable by their eyes. The turrets on the UTG 30mm integrate a durable clutch wheel system, which makes for firm, reliable adjustments. Typical, cap-based clutches can be over-tightened and under-tightened quite easily. That is not the case with this scope. Although this system results in exposing the controls at all times, the overall solid nature of each turret click setting staves off accidental adjustments to windage and elevation. The superior, emerald-coated optics, along with the wide field of view allow a respectable amount of light through the lenses. Better lenses transmit more light, but for the price its difficult to find anything comparable to the transmission afforded by this scope. The illuminated reticle can also result in a small amount of light pollution, but this is minimal and imperceptible in most conditions. This scope provides a side-turret for parallax adjustment all the way down to 10 yards! An optional 80 or 100mm add-on AO wheel can be attached to the turret (which is highly recommended) which allows for ultra-fine tuning of parallax focus. This affords the shooter with absolute accuracy at any range. The Leapers UTG scope itself comes with Picatinny-type mounts, but because of the 30mm tube, optional high-profile rings need to be used to gain clearance for the larger than average 44mm objective lens. The eye relief of this scope is 84 to 72mm, which gives ample forgiveness for use in tactical situations and allows for a significant view of the surrounding area. You should not underestimate the benefit of these numbers especially for tactical use. As a quick overview of the pros and cons of this amazing value scope we have put together this summary.